The Lockheed Martin F-35 Lightning II will come under scrutiny as Defense Department officials consider whether to proceed with an aircraft that could cost as much as $1 trillion to develop in coming decades. 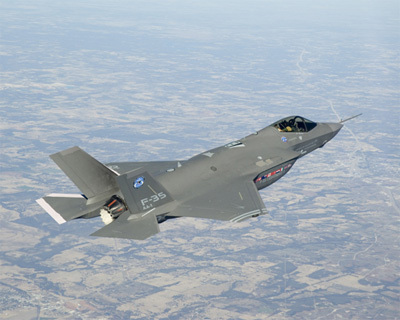 The Pentagon's senior weapons buyers are scheduled to meet Wednesday to consider plans to purchase 2,458 of the F-35 aircraft for the Air Force, Navy and Marine Corps. The Government Accountability Office said earlier this month that buying all the planes will cost $300 billion based on government data from December 2006. Another $650 billion will be needed to maintain and operate them. The GAO says the planes will average $122 million each in current dollars. Lockheed is waiting for an early-stage production contract for 12 planes, for delivery starting in 2010. A Pentagon cost update is expected next month. The GAO said that its own projections could rise with the new data. 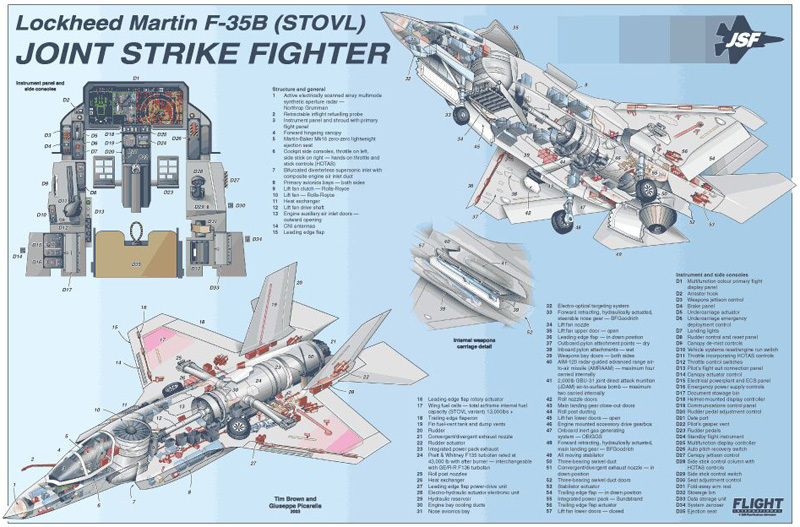 The Lockheed Martin F-35 Lightning II is a supersonic multi-role stealth fighter. Three F-35 variants derived from a common design, developed together and using the same sustainment infrastructure worldwide, will replace at least 13 types of aircraft for 11 nations initially, making the Lightning II the most economical fighter program in history. The program is on schedule to deliver aircraft to the U.S. military services beginning in 2010. The first test aircraft has completed 35 flights and has exceeded performance expectations. 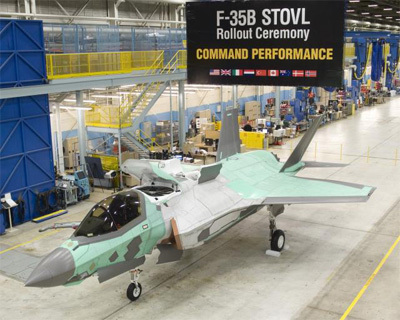 The inaugural flight of the first short takeoff/vertical landing F-35B is on schedule for mid-2008. The F-35 achieves its Very Low Observable stealth performance through its fundamental design, its external shape and its manufacturing processes. Special coatings are added to further reduce radar signature. The package is designed to remain stealthy in the harsh carrier-deck environment and in severe combat conditions, and tests have validated that capability. 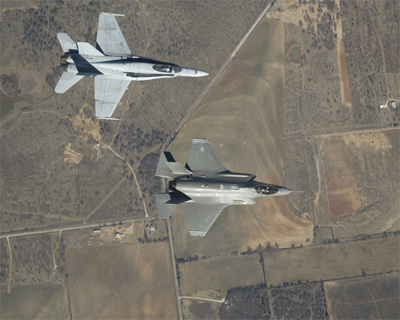 A total of 2,581 F-35s are planned for the U.S. and U.K. services, with more than 600 additional aircraft expected to be integrated into the air forces of seven other partnering nations. Built in three variants, the F-35 will replace AV-8Bs and F/A-18s for the U.S. Marine Corps; A-10s and F-16s for the U.S. Air Force; F/A-18s for the U.S. Navy; Sea Harriers, GR7s and GR9s for the U.K. Royal Air Force and Royal Navy; and other aircraft currently used by F-35 participant countries. The F-35A is a conventional takeoff and landing variant designed for use with conventional runways. The F-35B is a short takeoff/vertical landing version that can operate from small carriers, austere bases and deploy near front-line combat zones. The F-35C is designed to withstand catapult launches and arrested recoveries aboard the Navy’s large carriers. All F-35s are stealthy and supersonic, and incorporate the most powerful and comprehensive avionics suite ever flown on a fighter aircraft. 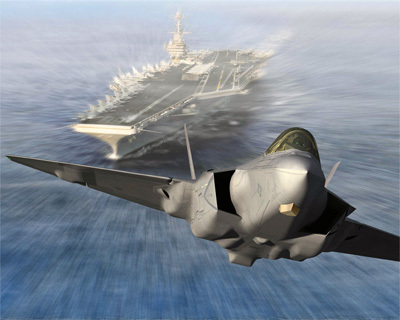 Lockheed Martin is developing the F-35 with principal partners Northrop Grumman and BAE Systems. Two interchangeable F-35 engines are under development: the Pratt & Whitney F135 and the GE Rolls-Royce Fighter Engine Team F136. Lockheed Martin Corporation is headquartered in Bethesda, Maryland, employs about 140,000 people worldwide and reported 2007 sales of $41.9 billion.